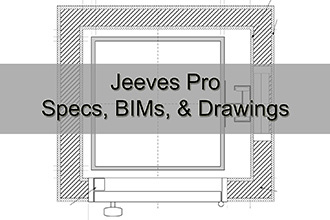 Jeeves Pro: These dumbwaiters are built for commercial applications. They are available in 2 standard sizes, with custom sizes available. The cab is constructed of powder coated steel. Stainless steel upgrade is available. The cab has a bi-parting gate. Landing doors are available in bi-parting, swing, or slide-up. Standard sizes of 24”w x 24”d x 24”h or 28”w x 28”d x 28”h. Custom sizes available.